H2O is a new, elegant Vaselli bathroom collection, designed by Irene Goldberg. 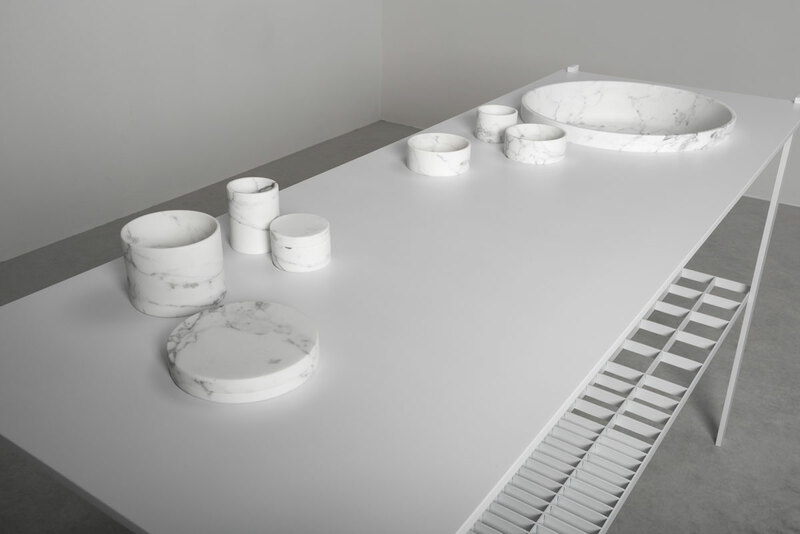 Consisting of a bathroom unit, shower tray, bathtub and accessories, it is inspired by the idea of research and innovation behind a scientific laboratory to develop a successful blend of two natural materials: stone and metal. Stone has been used in the ritual of bathing since ancient times. 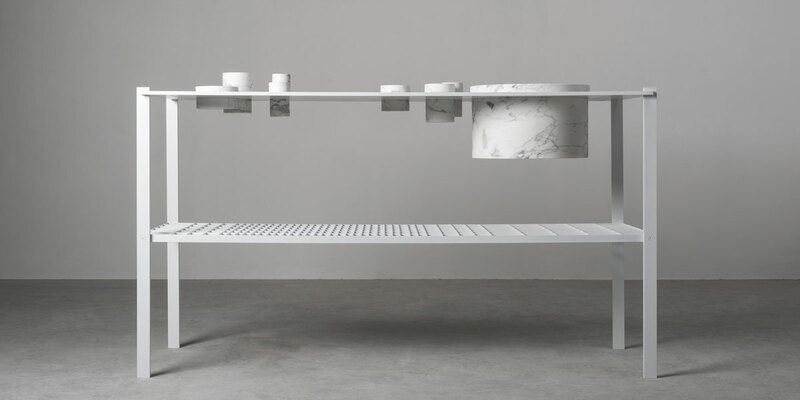 It remains the substance, which comes into contact with the water and the body, whereas the pure white coated metal gently embraces the stone units. The bathroom unit clearly alludes to the bench in a scientific laboratory. 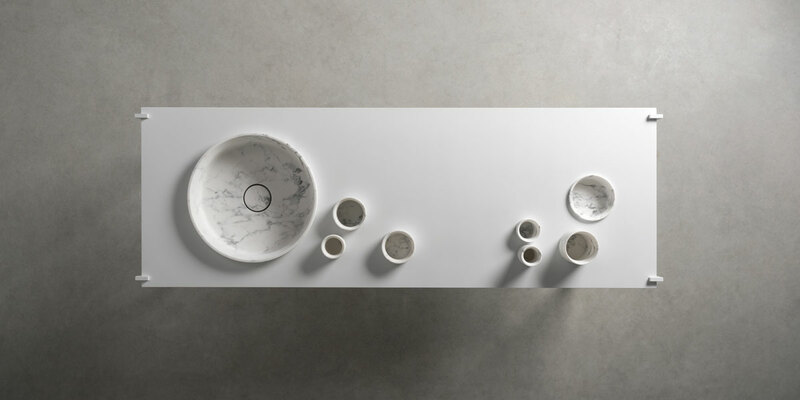 The minimal, metal structure supports a flat surface holding what appears to be a casual arrangement of containers, including the washbasin. These stone cylinders have been planed down until they are almost transparent. They recall laboratory glassware with bottles and ampoules of various sizes, each designed for a different purpose. This feeling of freedom and weightlessness, combined with Vaselli tailor-made nature, allows H2O to adapt perfectly to any need by inserting the containers in the desired position, number and size. 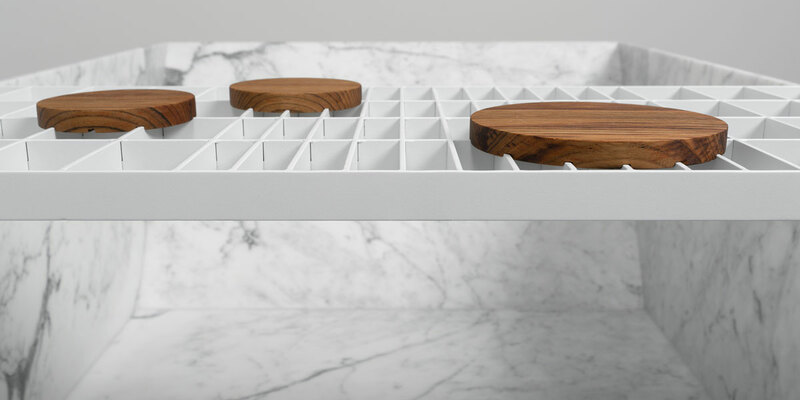 Below is a shelf created from a metal rack with a dual function, acting as a base and structural reinforcement without compromising the lightness of the unit. 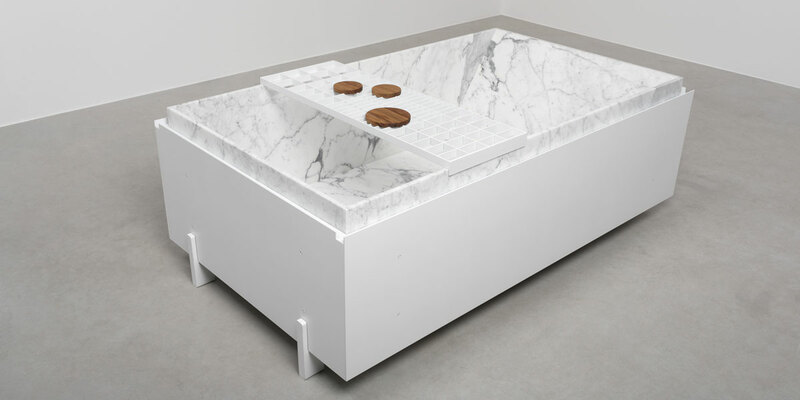 The shower tray is a variation of the same concept. 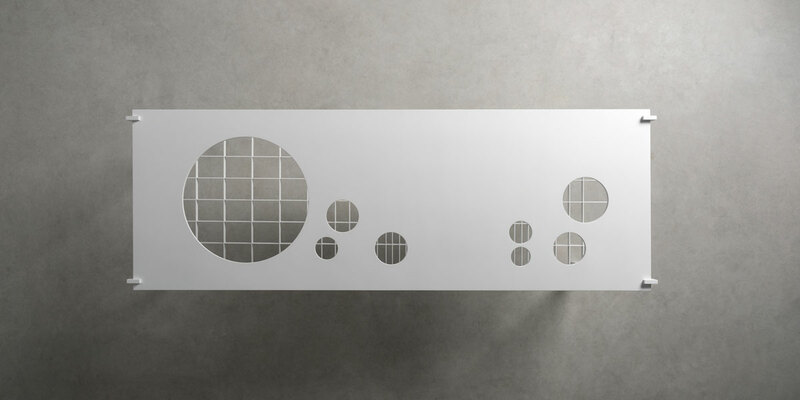 The tray is made by hollowing out a single slab of marble to create an undulating movement of circles, which brings to mind the unpredictable arrangement of laboratory glassware. 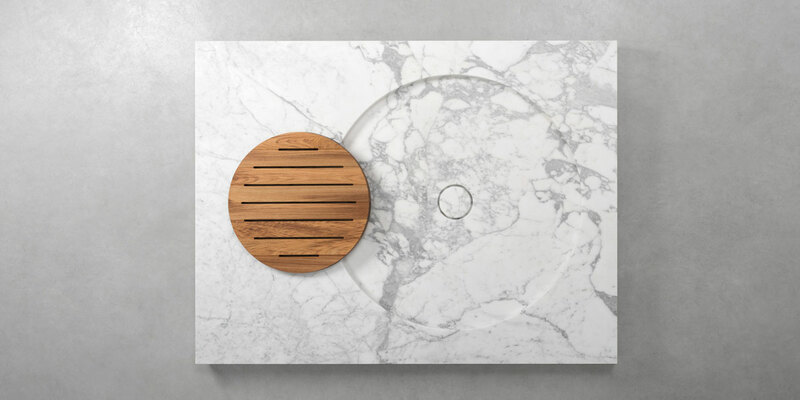 More specifically, the two intersecting circles provide a bathtub in the large circle and a practical, teak, anti-slip area within the smaller radius. One side of the shower tray holds the iron grille, which acts as a screen. Metal also embraces stone in the bathtub to give a double layer effect. Inside in contact with the body is in stone to gratify the skin, whereas the outer, white metal shell gives the parallelepiped a sense of cleanliness and weightlessness. The metal rack resting on the bathtub becomes a useful sliding surface for accessories and bath products. 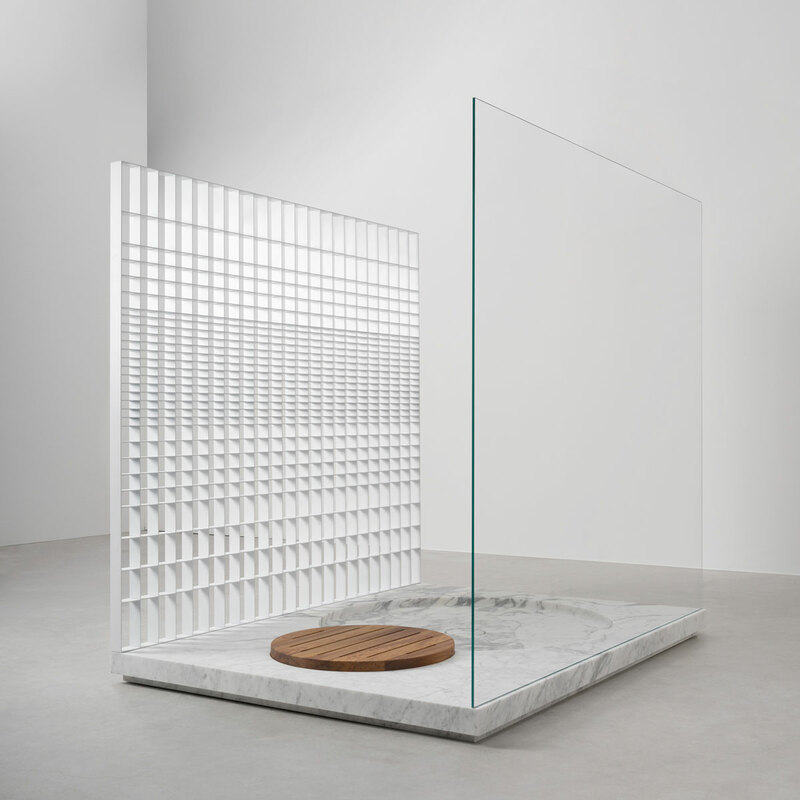 Irene Goldberg’s vision is one of contrast between the softness of the stone elements and the rigidity of the metal structure containing them. It recalls the balance between traditional craftsmanship and Vaselli’s technological innovation to create designer shapes and functions without any compromise. The bathroom unit of the new collection will be exhibited for the very first time at the Listone Giordano Arena in Via Santa Cecilia during the Milano Design Week 2019, from 9 to 14 April.